"Lights went out in 4,085 cities in 88 countries in what is being described as the largest demonstration of public concern about climate change in history." Very cool photos of participating cities can be seen on Boston.com. 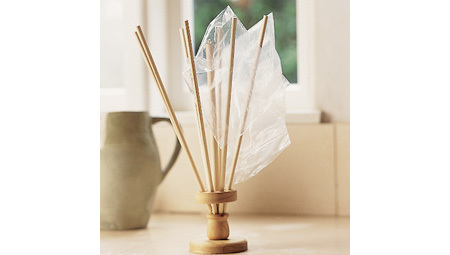 Instead of tossing your Ziploc bags after one use, wash and dry them with the rest of your dishes for reuse. Unless the bags have holes or have contained raw meat, it’s easy and makes sense to use your dish wand to clean out the inside before hanging the bags on a spoon or pot handle to dry. Gaiam sells a great one (pictured). Also available at Amazon.com. 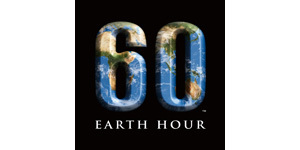 "Earth Hour isn’t about how much energy is saved during one hour. 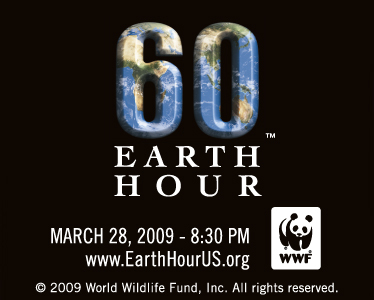 The idea behind Earth Hour is that by working together, each one of us can make a difference on the issue of climate change. By doing something as simple as turning off the lights, we send a visual symbol to the world’s leaders that we are counting on them to work together to find solutions to climate change." Facebook. Like it or not, it’s becoming harder and harder to resist joining the globe’s most prominent online social networking world. However, “The FB” does offer quite a few avenues to help heal our planet, one post, status update and green patch at a time. Here’s how it works: go to Causes Home and search all of the causes that are out there. You can “Become a fan” which helps get the word out to your Facebook friends and family. You can “Donate to a cause” which not only funds your favorite efforts, but also encourages and recruits your friends to do the same. Don’t be afraid to ask. 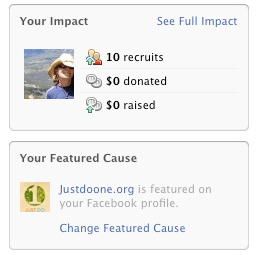 At Causes Home, you will start to see your impact for causes joined (see left) and what you are doing to recruit, and donate and raise money! Check out Just Do One's Cause page here. Check us out on NBC! Try as we might, not all of our plastic food containers are recyclable. But instead of tossing the plastic you can’t recycle, considering using it again in replace of those eco-unfriendly Tupperware containers. One quick rinse (remember that it’s best to hand-wash plastics as opposed to running them through a dishwasher, which uses extremely hot water that can result in unwanted exposure to Bisphenol A) and your old containers are good as new. Worried about confusing one food product for another? Use a strip of paper tape to cover old labels and record contents and date. Introducing 1% For the Planet from coreindustries on Vimeo. When it comes to the environment, a little goes a long way. While the folks behind Just Do One and each of you who have pledged know this on a personal level, there are some amazing business programs that further the cause. One organization in particular stands out. 1% for the Planet defines itself as, “A growing global movement of 1,116 companies that donate 1% of their sales to a network of 1,718 environmental organizations worldwide.” Make sure to look for the 1% logo on your favorite business’ websites and products. To learn more, visit onepercentfortheplanet.org. Don’t dismiss yesterday’s news just yet. Turns out, old newspaper is a great household cleaner, specifically when it comes to windows and glass. Instead of buying pre-soaked, chemically potent glass cleaners, or ripping of a string of paper towels to wipe away grease and grime, try a new approach. Spray your surface with ammonia or vinegar and then, starting at the top and working your way down to avoid drips or streaks, wipe dry with crumpled newspaper. The newspaper leaves your windows clean and applies a film that is resistant to dirt! Entertaining the Eco Idea with "Out There"
Leonardo DiCaprio and Al Gore aren’t the only ones bringing environmental causes to the big screen. Teton Gravity Research—an action sports filmmaker based in Jackson Hole, Wyoming—in conjunction with The Surfrider Foundation recently released Out There, a 16mm HiDef surf film highlighting some of the sport’s best athletes riding some of the world’s most threatened waves. From Chile to Tahiti to Trestles in Southern California, Out There rocks a beachy sound track while taking the viewer from crest to coast with such names as Ian Walsh, Donavan Frankenreiter and Greg Long. The athletes take a look at humankind’s impact on some of their favorite spots as they raise awareness, advocate environmental protection, and encourage positive action in the name of our oceans. 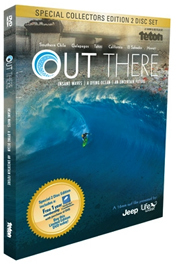 Check out the Out There trailer or visit surfrider.org to learn more about how you can help. If you have elected to learn more about where your food comes from (and subsequently, the impact our food system has on our planet), you have likely come across the best-selling book, The Omnivore's Dilemma: A Natural History of Four Meals and it's follow-up title, In Defense of Food, by Michael Pollan. In a blog post yesterday for the New York Times, Pollan calls for reader's "food rules." He will be posting suggestions on his website and including the best in a collection of food rules that he is working on. Submit your rules in the comments section of the blog post, linked here! As a self-proclaimed food snob (and very picky eater) I can't wait to contribute!